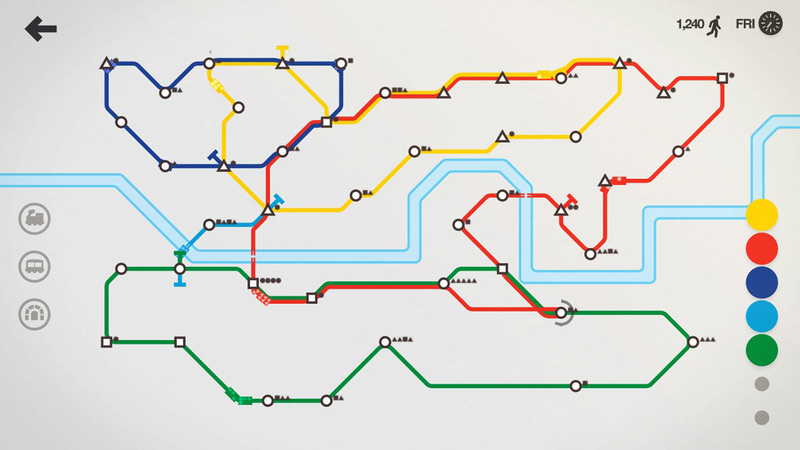 Mini Metro is a stroke of genius. 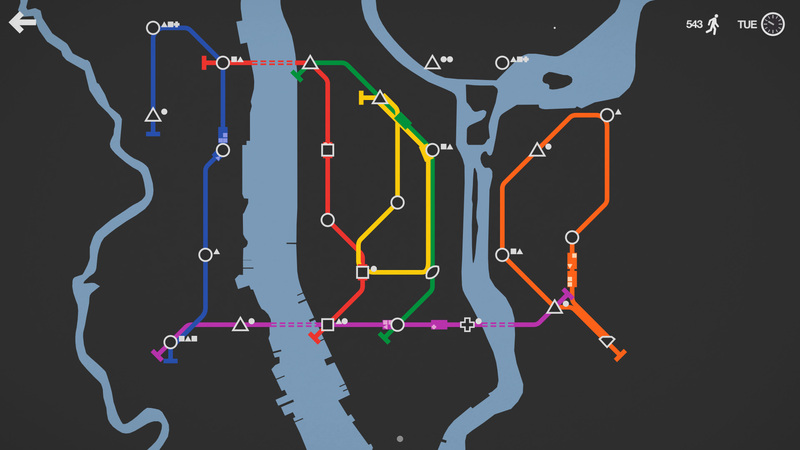 Building on the visual design of modern transit maps, it’s a puzzle game that sees players trying to expand a rail network to accommodate the rapidly growing number of passengers. Inevitably, the system becomes overloaded and you lose the game—and then it’s on to the next. Stations in Mini Metro are represented by geometric icons, as are the passengers using the network. Your goal is to get each passenger to a station that matches their symbol by way of a (hopefully) efficient train system, which you build by connecting the different stations with rail lines. This is where things get puzzley. Unlike a simulation or management game—with which you’d typically associate building railways—each line can be as long or short as it needs to be, without the need to worry about building costs. You can freely move tracks as you see fit to accommodate the new stations that pop up (unless you’re playing in Expert mode, where everything is locked in place as soon as you set it down). However, you have only a limited number of lines, trains, and bridges or tunnels—which are necessary for crossing bodies of water—at your disposal. As your network grows bigger, managing those resources gets more difficult. At the same time, the sheer volume of passenger numbers makes it harder to get everyone where they’re going. Eventually, a station will reach its limit on how many waiting travellers it can hold, and you’ll hit that game over screen. Related reading: Framed is another series of ingenious puzzle games, created by Australian indie developer Loveshack. Read our review of Framed Collection for Switch. It’s a very simple concept, and it takes little more than a few moments to get acquainted with how Mini Metro‘s puzzles work. At the same time, there’s enough depth for a wide range of approaches, and with games that are easy to jump into and tend to be over quickly, “failure” is more a chance to try again for a better score than the frustrating experience that game overs usually are. The 20 different maps, all based on real-world cities and all sporting their own unique quirks—like Hong Kong’s rapid rate of station and passenger growth, or San Francisco’s reliance on bridges to connect the city proper, Oakland, and the Bay Area—all work to keep things interesting. Such a brilliant concept so expertly delivered made Mini Metro one of the most memorable games of 2015, when it first released for PC. The mobile version has kept me busy for many a commute, as I know it has for plenty of others, as well. Now, that brilliance comes to Switch, where it finds a natural home. Mini Metro always felt like a more natural fit for a handheld device; the Switch version delivers that, but with the added benefit of a choice between touchscreen and controller inputs. There’s also the option of two-person multiplayer with each player holding a single Joy Con, but rather than a separate game mode, you can simply play any of the regular modes with two players. That’s a great decision, because rather than a more structured multiplayer experience, you get this wonderful dynamic that’s both cooperative and competitive. Ideally, both players would work together to manage your train network, and when all goes together and both players are in harmony, it’s a very collaborative experience. But with both players drawing from the same pool of resources, and in all likelihood having different ideas about how best to proceed, it can quickly turn into a sort of pseudo-competitive party game. You want to build a bridge here, but the other player wants to build one there, so you end up in a back and forth moving one another’s rail lines about, getting annoyed with one another’s decisions until eventually your lack of teamwork brings your railway to a halt. It’s like a cooperative game with seeds of discord deliberately sown in, which is always a fascinating experience. 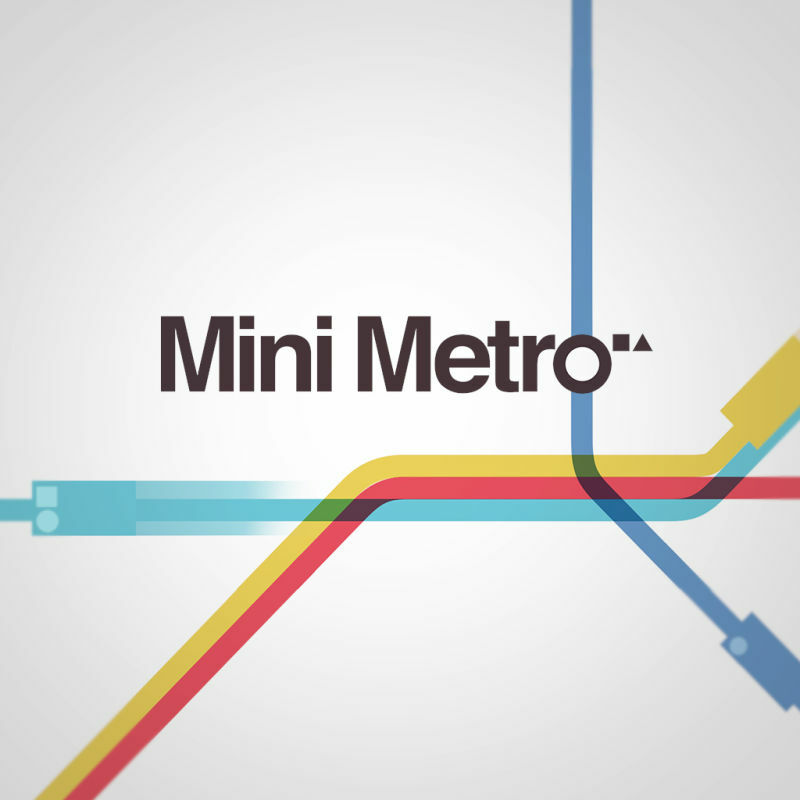 Though there’s nothing new about it, the Switch version gave me a newfound appreciation for Mini Metro‘s music. Most of my time with the game before now has been on the mobile version, where I almost always play with the sound off or some other music playing alongside. On Switch, I’m more inclined to play games with their music on, so it was the first time I really got to discover the ambient noises that come together to create a sort of background music for Mini Metro. When you start a game, there’s nothing but some barely-audible background noise, but as your network grows larger, that ambience gets louder and more dense. At the same time, every interaction between different aspects of the game system—passengers boarding or disembarking a train, new stations popping up, etc—adds an audio note to the aural fabric. Gradually, that builds up into a cascade of procedurally-generated ambient music that’s both relaxing and motivating. This concept could easily have just resulted in a cacophony of different sound effects vying for attention, but the timing of the different game events is so perfectly calculated that everything lines up to create one of the most unique soundscapes you’ll hear in a game. Similarly, I never knew about Mini Metro‘s extensive language options before playing the Switch version, because in the mobile version this is automatically determined based on the system language. On Switch (as on PC), language is an option within the game’s settings menu, and I don’t think I’ve ever seen more languages available in a single game. 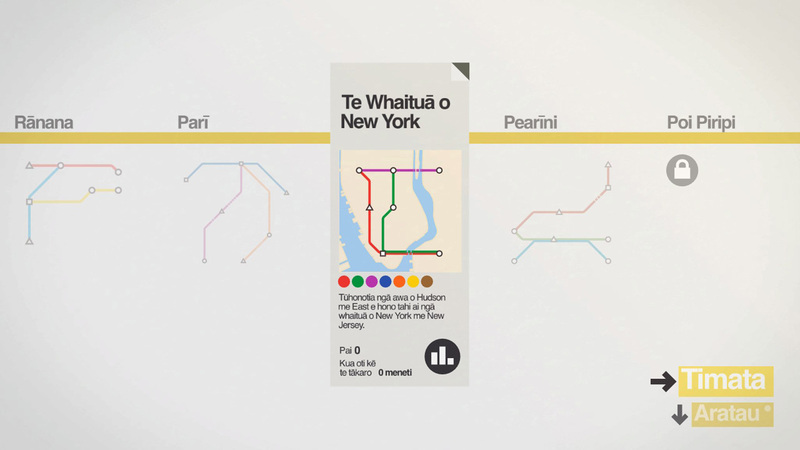 Mini Metro has been localised into around 44 different languages, including many that you don’t often see in video games, like Welsh, Catalan, Gaeilge, Tajik, and te reo Māori. It helps that there’s relatively little text in the game to translate, but the effort that’s been put into allowing as many people as possible to play in their native language is a welcome one. As a New Zealander, I’m overjoyed to see te reo Māori in there. This is a language that was almost made extinct through European colonisation of Aotearoa (New Zealand), but there’s been a concerted restoration effort over the last 30 years or so. 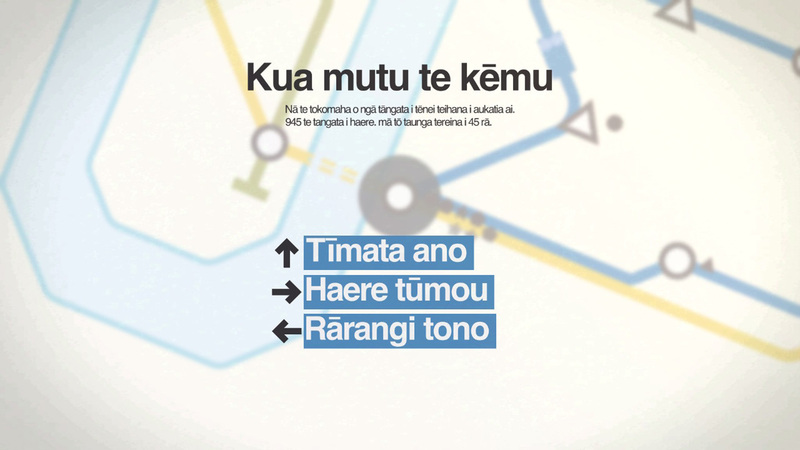 To see te reo Māori in a video game is both a product of that restoration and a contribution to the ongoing effort to help the language flourish. It’s a wonderful thing to see. Mini Metro on Switch isn’t all that different to Mini Metro on other platforms, but it allows everything that makes the game so great to really flourish. You’ve got the portability of the mobile version, coupled with the visual and aural stylishness that sometimes gets lost when you’re playing a game on a mobile phone. The two-player option is a nice touch, but the main appeal here is having one of the best puzzle games of recent memory on the best portable console—and having the option to play it in te reo Māori.